INVERNESS, Scotland — The drive from St. Andrews to Dornoch through the Scottish Highlands is about four hours long, but that's driving without stops. And if you're driving through the Highlands without stopping, you're a fool. The northern region is incredibly beautiful and filled with little gems all along the A9 and A96 highway begging for you to pull over and have a look. And no Scottish golf vacation is complete without at least a couple days in the Highlands playing the renowned Royal Dornoch, Nairn Golf Club and if you can make it even further north, Brora. After you've begun your trip in St. Andrews, Edinburgh, Aberdeen or in the central at Gleneagles, take a day off and take a leisurely drive up to the Highlands. Another reason to set a day aside is most attractions are free or just a few pounds. Scotland is filled with medieval castles and the Highlands have plenty of its own. It isn't a question of whether you visit a castle while you're here, it's how many will draw you in. One of the first you'll encounter on your drive up is the Blair Castle, just south of the Highlands border. This 13th century castle is one of the country's most popular. Inside, a series of rooms are on display including the Atholl Highlander Room, which commemorates Europe's only remaining private army which is headquartered at the castle. Near Inverness, one of the most stunning castles is the Urquart Castle on the shores of Loch Ness. It's one of the country's largest castles and was built in the 13th century. It has a turbulent history: seized by the English in 1296, sacked in 1545 by MacDonald Lord of the Isles and later left to decay after 1689. Today, its storied grounds are open year round to visitors. In the Grampian Highlands region is Balmoral Castle, west of Aberdeen on A93. It's the Scottish holiday home of the Royal Family and open to visitors in the summer months. If you're up for a series of castles, try the Grampian Castle Trail (aberdeen-grampian.com/castletrail.htm), which features 11 castles west and north of Aberdeen. Whiskey distilleries dot the Highlands and most offer free tours and tastings. The famous Scottish whisky brand Tomatin's original distillery, opened since 1897 is located about 15 minutes south of Inverness on A9. Free tours about a half hour are given daily, and culminate with a tasting of their 12-year old single malt Scotch — in the gift shop of course, where you can pick up all your Tomatin souvenirs and choose from a selection of their whiskys. Capital of the Highlands, Inverness is the last "big" city you'll encounter on your way up to Dornoch. There are a few sights you can check out, from cathedrals to the River Ness, which is dominated by the St. Andrew's Cathedral overlooking it. A wide variety of shopping ranges from the Victorian Market to the new Eastgate II complex. The Moray Firth is also home to bottlenose dolphins and can be seen from the shore, or trips into the firth are available as well to get a closer look from Inverness Harbour. Located just east of Inverness on A96 on the way to Nairn is the infamous Culloden Moor: scene of the last major battle fought on mainland Britain and is one of the most iconic and emotive sites of Scotland. The battle that took place in 1746 ended Jacobite hopes of restoring the exiled Stuart dynasty to the throne of Britain. Prince Charles' army was crushed within an hour by government forces, and the brutal enforcements imposed afterwards signaled the end of the distinctive way of life for the people of the Highlands. The legend of the Loch Ness Monster is known all over the world, so chances are your curiosity will lure you in as you drive through Inverness. Try and arrive just before sunset to catch the loch at its eeriest, with low clouds setting in over the mountains. You can take a drive along the Loch and there are various stopping points where you can get out and snap photos, walk along the rocks on the edge, or stop off at one of the visitors centers. If you're stopping for the night in Inverness or don't mind going to Dornoch a little later, you can take a cruise out onto the Loch for dinner. 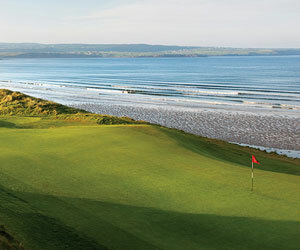 Royal Golf Hotel: The Royal Golf Hotel is a three-star hotel located right on the first tee's doorstep. Just walk through the back yard and you're there. It also has spacious rooms and a nice dining room and lounge that serve free breakfast for guests and there is also a nightly dinner. From the hotel you can easily walk to downtown Dornoch as well. Newton Hotel, Nairn: For a more southern base, the Newton Hotel in Nairn is a fine, four-star option, located near Nairn Golf Club and Nairn Dunbar. It's modern and stylish and has large rooms and Wireless internet access (which is difficult to find in the Highlands). It also provides easy access to Inverness and Aberdeen, located just off of A96. Claymore House Hotel, Nairn: Also located near Nairn Golf Club and Nairn Dunbar. The Claymore House is situated on Seabank Road in a quiet residential area filled with Victorian houses. Close to the beach. The staff is extremely attentive and the each room has it's own unique character.